A dark and labyrinthine thriller from a bold new voice in crime fiction It is 1981. 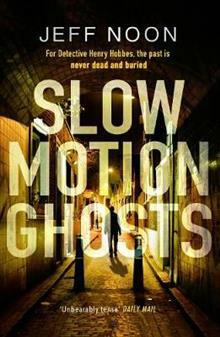 Bringing the trademark imagination of his acclaimed early novels, Jeff Noon has delivered a police procedural with a difference - an intricate, twisting crime novel that pulls you in and doesn't l... read full description below. A dark and labyrinthine thriller from a bold new voice in crime fiction It is 1981. London is bruised by austerity, social unrest and racial tension, and the police are at war. Anger has erupted in the Brixton Riots and is finding expression in protest, anarchy and punk. For Detective Inspector Hobbes, the battle lines are being redrawn within his own ranks as right and wrong are clouded by prejudice. Into this mess comes a murder. A promising young singer has been maimed and killed and the artistry of the crime is disturbing. On the hunt for the killer, Hobbes begins an investigation that will lead him deep into a subculture hidden beneath the everyday. A cult of personality that hides from the problems of the city and escapes to a world of its own, a world that is at once seductive and devastating. How far will Hobbes have to go to learn the truth? And how many more must die before he does? Bringing the trademark imagination of his acclaimed early novels, Jeff Noon has delivered a police procedural with a difference - an intricate, twisting crime novel that pulls you in and doesn't let go. Jeff Noon is the author of six acclaimed novels, Vurt, Pollen, Automated Alice, Nymphomation, Needle in the Groove and Falling Out of Cars, as well as two collections of short fictions, and is also the crime fiction reviewer for The Spectator. He lives in Brighton. Jeff Noon trained in the visual arts and drama and was active on the post-punk music scene before becoming a playwright, and then a novelist. His novels include Vurt, Pollen, Automated Alice, Nymphomation, Needle in the Groove, Falling Out of Cars, Channel SK1N, Mappalujo (with Steve Beard), A Man of Shadows, and the The Body Library. He has also published two collections of short fiction, Pixel Juice and Cobralingus. He lives in Brighton.